Beautiful Gulf views from your 5th floor screened-in, balcony. Sunsets every night over the sparkling waters, barrier islands and Sanibel Island! 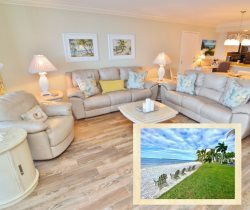 This beachfront vacation condo in Sanibel Harbour is well appointed with a delightful palate of neutral, cranberry, dark yellow and green tones to make up an appealing Florida style décor. Equipped with newer appliances, furniture, and crown molding throughout. Enjoy various games, puzzles and books; or relax in the comfy recliner while reading. There is a HD TV and DVD in the living room and TV’s both bedrooms. King bed in the master and two twins in the guest bedroom. You may have found this rental on HomeAway 4363841, HA ID 4363841, VRBO 4363841, or Vacation Rentals 4363841. Our stay at your property made our vacation a beautiful and relaxing experience. The gorgeous views and convience of the nearby hotel were enjoyed on a daily basis. We also took advantage of the restuarants and thought the food and service were excellent. The breathtaking sunsets will definitely have us coming back as well as your lovely condo.